2014 repress; LP version. Originally released in 2005. "In the '90s, with projects and labels such as Basic Channel, Maurizio or Main Street Records, the Berlin- based producer team Mark Ernestus and Moritz von Oswald have decisively influenced the development of techno-house and electronic music worldwide. Furthermore Ernestus and von Oswald have released pioneering hybrids of reggae, dub and electronica under the name Rhythm & Sound since 1996. In the last few years an utterly original and independent definition of reggae music -- stripped down, rootsy, hi-tech -- has emerged from their activities. For their latest Rhythm & Sound album Ernestus and von Oswald collaborated with legendary reggae vocalists, like Cornel Campbell, Jennifer Lara, Love Joy or The Chosen Brothers (aka Lloyd 'Bullwackie' Barnes). 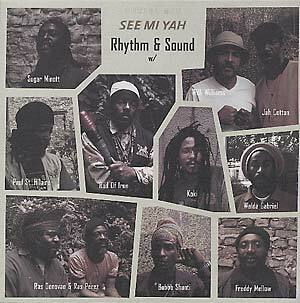 See Mi Yah is a classic one rhythm album, typical format and production approach reggae, featuring ten vocal versions and one instrumental of the See Mi Yah rhythm."